RALEIGH, N.C. — This year’s NCAA Tournament features a top tier of teams that are heavy Final Four favorites, starting with No. 1 overall seed Duke and star freshman Zion Williamson. Figuring out how to stop them won’t be easy. Gonzaga joined the Atlantic Coast Conference trio of Duke, Virginia and North Carolina atop the four regional brackets, followed Michigan State, Tennessee, Kentucky and Michigan as No. 2 seeds. These eight teams have won 85 percent of their games this season. And nearly half of their games lost (18 of 40) have come against another team within this group of 1- and 2-seeds. At the free throw line, 69 percent could be a problem for the Blue Devils in a close game. Fans already know all about Virginia’s worst-case scenario thanks to No. 16 UMBC trouncing the overall No. 1 Cavaliers in last year’s first round. This year’s team plays similarly with a style that can reduce its margin for error. Virginia again has the tough defense and methodical tempo offense, a combination that tests the discipline and patience of its opponent. Behind Kyle Guy, Ty Jerome and De’Andre Hunter, the Cavaliers own their most efficient attack since coach Tony Bennett’s breakout season there in 2014. If they struggle for stops and get behind, it can be difficult to reverse momentum with fewer possessions to work with thanks to their pace — illustrated in Friday’s loss to Florida State in the ACC Tournament semifinals. The Tar Heels have three scorers capable of big games with Cameron Johnson, Coby White and Luke Maye. And they’re at their best when loose in transition or attacking the glass. Despite its rebounding prowess, UNC lacks a true post scorer — a staple of Roy Williams’ best teams — and can struggle matching up with bigger teams. And its perimeter strength makes the team more dependent on the 3. The Zags have KenPom’s most efficient offense (125.1 points per 100 possessions) and a solid frontcourt with Rui Hachimura, Brandon Clarke and the return of Killian Tillie. Gonzaga is the only team to beat a fully-healthy Duke squad this year. But the Zags struggled on the perimeter in the West Coast Conference Tournament title game against Saint Mary’s. Their guards couldn’t increase the tempo, so Gonzaga had to grind out halfcourt possessions and made just 2 of 17 3-pointers in the 60-47 loss. Tennessee: Coach Rick Barnes has expressed concern about his team settling for 3-point shots instead of attacking the paint. Michigan State: The Big Ten champions often struggle to keep possession. The Spartans rank 319th in the country in turnover margin (minus-2.6) and have averaged 15.8 turnovers in six losses. Kentucky: Can Kentucky hit more 3s if needed and stop opponents from doing the same? John Calipari’s Wildcats made 199 3s — fewer than all but five power-conference teams — while attempting among the fewest in the country. 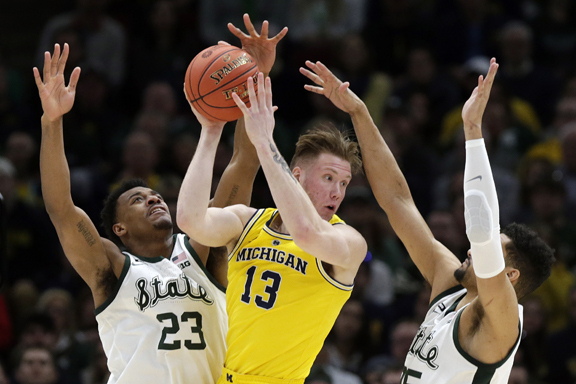 Michigan: While John Beilein’s Wolverines have one of the nation’s top defenses, they haven’t rebounded particularly well. Michigan has been outrebounded in five of its six losses by an average margin of more than nine boards per game.